The panel’s debate on the bill led to “the unusual sight of Democrats sparring with one another,” said Jim Puzzanghera in the Los Angeles Times. 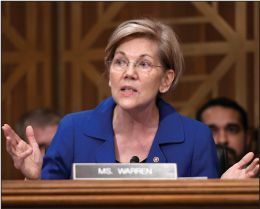 Several Democrats on the committee questioned the need for regulatory relief at a time when “bank profits have been soaring.” Sen. Elizabeth Warren and others attempted to blunt the rollback of some of the regulations and to add consumer protections to the bill, but they were thwarted by fellow Democrats who said that while they supported the amendments, they wanted to “avoid endangering GOP support” for regulatory relief for smaller banks. Disney and 21st Century Fox are nearing a blockbuster deal worth roughly $60 billion, said David Faber in CNBC.com. The two companies have been in talks for several weeks after the Rupert Murdoch–run Fox signaled it would be open to off-loading its movie studio and entertainment channels, including FX and National Geographic. Under the rumored deal, Fox would sell its entertainment assets and some international properties, including a stake in the British broadcaster Sky, “and keep its news, sports, and broadcast network.” Fox has also been in talks with Comcast, but the talks with Disney have progressed faster. Chipotle Mexican Grill is seeking a new leader “with demonstrated turnaround expertise,” said Tiffany Hsu in The New York Times. The beleaguered fast-casual chain last week announced it is replacing Steve Ells, its founder and current chief executive. Ells established Chipotle in Denver in 1993 and oversaw its expansion to more than 2,350 locations. But in 2015 “Chipotle began dealing with the first in a long series of scandals,” including persistent food contamination issues. Ells, who will become executive chairman “once his successor is found,” drew “investor scrutiny” last year over his annual pay of nearly $16 million.